The location of the apartment. The interior design inside the room as it’s nice & new. nice location, nice facilities, clean room. everything you need for stay is there. lovely apartment with all you needed for your stay ,five mnutes away from the centre. communial parts of the building are under renovation but didn't make much noise. just look for the zepter sign in the central square and you cant go wrong. Easy to get there. Arrived late at night - it was easy to pick up the keys and made check-in. Shared bath is pretty good, same as on pictures. All troubles we had were resolved quite easy! Recommend! Really enjoyed my stay. The room was very clean, great location and kitchen was fully functional. Staff were great, as was location. WiFi was good in the room too. 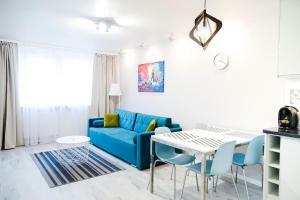 Lovely warm, comfy and well equipped apartment. Good location, close to the main railway station and only 20 minutes walk from the Old Town. Everything was fantastic. Ladies in the office very helpful and polite. Apartment very clean and brand new. I felt like my private space . Amazing view . Short walk distance from Zlote Tarasy shopping mall. The appartments are really in the centre of the city and all the nessesary things like public transport, shopping centre and restaurants are just minutes away. Great location! The place was really clean and the beds were super comfortable. From the location it was really easy to walk almost everywhere. I would totally recommend this place if you want something cheap but really nice for your stay in Warsaw. 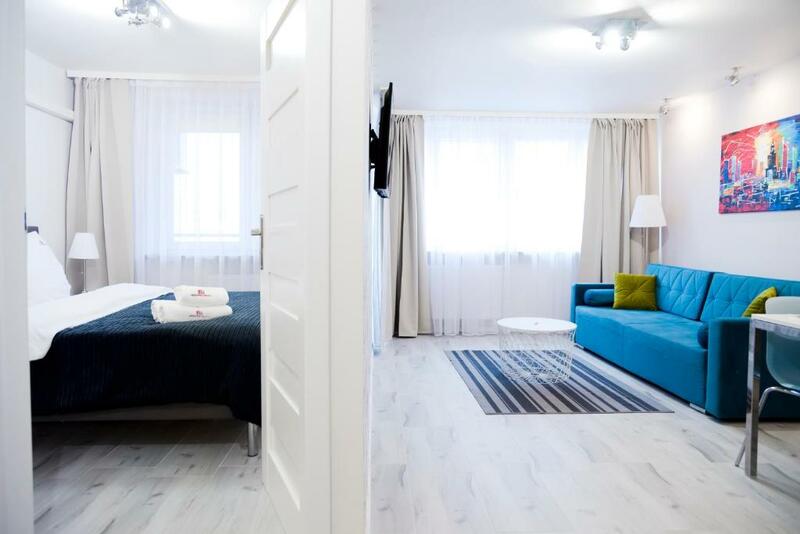 Lock in a great price for Hosapartments City Center – rated 8.5 by recent guests! 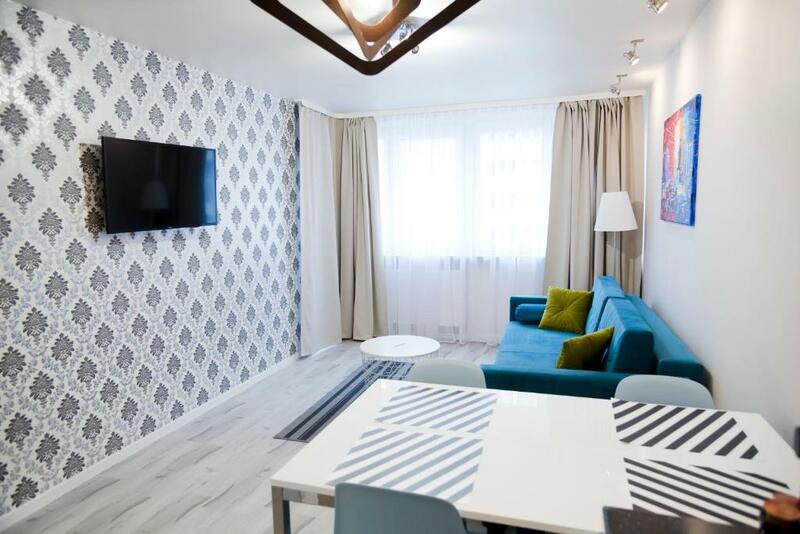 Hosapartments City Center are located in the center of Warsaw, 2,300 feet from Warsaw Central Railway Station. It offers a TV and a fully equipped kitchenette. The apartments are located in three neighboring buildings. They are classically furnished and decorated with panel floors and bright colors. They come with a seating area with and a bathroom with a shower and a hairdryer. Breakfast is served in a neighboring restaurant, Vincent. 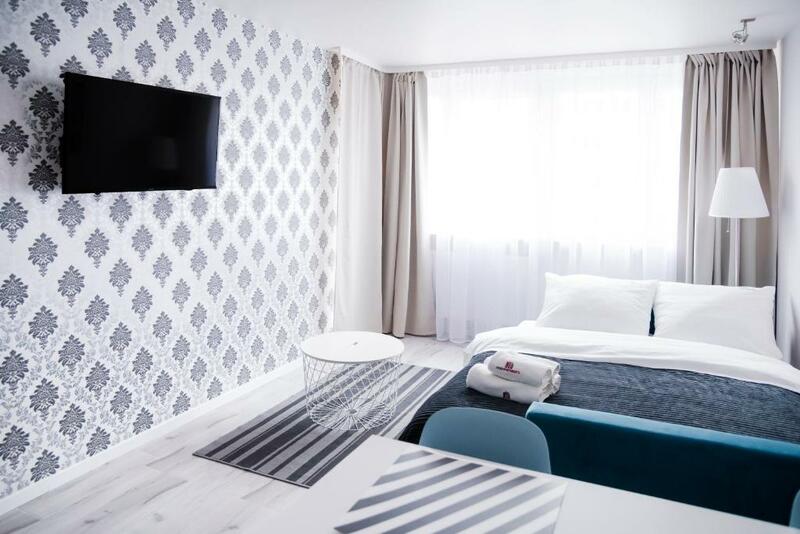 Hosapartments City Center is located 500 feet from Świętokrzyska Metro Station, which makes for a convenient starting point for getting around the city. Free Wi-Fi connection is offered. Luggage storage is available in the reception office. Palace of Culture & Science is 1,500 feet away. The nearest airport is Warsaw Chopin Airport, 4.3 mi from the property. 뀐 Located in the real heart of Warsaw, this property has an excellent location score of 9.2! When would you like to stay at Hosapartments City Center? Located at ul. Bagno 7, this apartment features a TV, a bathroom and a kitchenette, as well as the view of the courtyard. Private parking is available at a location nearby (reservation is needed) and costs PLN 40 per day. Apartment located at ul. Bagno 5. It is a studio with kitchenette and bathroom with shower. There is a TV with cable channels. Apartment located at ul. Bagno 3 or Bagno 7. It comes with a kitchenette and a bathroom with a hairdryer. Apartment located at ul. Bagno 3. It comes with a kitchenette, a seating area and a bathroom with a hairdryer and a washing machine. Located at ul. Bagno 5, this studio features a view of the Palace of Culture, a seating area and a bathroom with a hairdryer, as well as a kitchenette. The superior studio is located at ul. Bagno 3 or 7. It comes with a fully equipped kitchen, a bathroom with a shower and a hairdryer, as well as a washing machine. This apartment features a fully equipped, modern kitchen and a bathroom with a shower and free toiletries. It offers a view of the center of Warsaw. Located at ul. Bagno 5, on the ground floor, this modern apartment features a fully equipped kitchenette and a separate bedroom. This one-bedroom apartment comes with a fully equipped, modern kitchenette and a bathroom with a shower and free toiletries. It also comes with a balcony overlooking the green area. Located at 5 Bagno Street. This apartment includes a fully equipped modern kitchen and a bathroom with a shower and a free set of toiletries. Guests can enjoy views over the center of Warsaw. This apartment features a modern, fully equipped kitchenette and a bathroom with a shower and free toiletries. It offers a view of Warsaw. This apartment features a modern, fully equipped kitchenette and a bathroom with a bath and free toiletries. It offers a view of Warsaw. This 1st floor modern apartment features a fully equipped kitchenette, a bedroom and a balcony. This one-bedroom apartment comes with a fully-equipped, modern kitchenette and a bathroom with a shower and free toiletries. It also comes with a balcony overlooking the green area. Located at 3 Bagno Street. This studio apartment comes with a fully equipped, modern kitchenette and a bathroom with a shower and free toiletries. It comes with a washing machine. Location:3, 5 or 7 Bagno Street. Hosapartments offer several apartments in three buildings located from each other at a short distance in the perfect location. The offer is addressed to families, families with children, couples and small groups of friends and singles. We are hoteliers, why always we will offer you a tour of interesting places, events in the city or entertainment directed exclusively for you. During several, a dozen or so minutes you'll be in the center of events you want to see. ZŁOTE TARASY shopping facilities and complex on Marszakowska Str. Palace of Culture and Science. Grzybowski Square and the Synagogue and restored Próżna Str. Central Station and the Defilad Square, where there is a bus stop Modlin. Subway. House Rules Hosapartments City Center takes special requests – add in the next step! All children under 2 years are charged PLN 20 per night in a crib. Hosapartments City Center accepts these cards and reserves the right to temporarily hold an amount prior to arrival. Guests are required to show the credit card used for the booking upon check-in. In case the card was not theirs, the guest will be required to pay upon arrival, and the money charged from the card used to make the booking will be refunded. Guests are kindly requested to contact the apartment at least 1day in advance in order to arrange a check-in and key collection and inform Hosapartments Atelier Residence about the expected time of arrival. Please inform Hosapartments City Center of your expected arrival time in advance. You can use the Special Requests box when booking, or contact the property directly using the contact details in your confirmation. The towels were clean but it would be nice to change them as you can see they are really old and used. Building and hall looks horible. Everything. Room, cozyness, clearness. Perfect! We were looking for a short time stay in downtown Warsaw. You wouldn't know from outside but inside, every room is newly refurbished with Ikea furnitures and is very comfortable. They are located at walking distance from everything. Management was very nice and always answered very quickly to our requests. I would absolutely stay there again. The room is quite small for 3 people, especially when we have 3 big luggages and 3 carry on bags so we have to adjust and find the space to leave them on the floor. Very clean and nicely decorated apartment. I booked this for my parents and they stayed the first night and booked in to other accommodation for the rest of the stay as they didn’t get a wink of sleep they felt so uncomfortable in the surroundings and it was very noisy and judging by the photos the building was horrendous the apartment was in. The room itself was clean and tidy but that’s all it had going for it. Difficult to reach by car because it was in the city center and one way street. The apartment is small, but comfortable, well equipped and has comfortable beds)). The room was clean, everything was new. The apartment is exactly like in the pictures. Were in early January - the apartment is really warm! Great location, close to the center, metro within walking distance, near a supermarket. Very friendly staff. The pictures on booking.com is far away from the reality... We was shocked by the old building, the old apartment (except the bathroom) and the bad smell when we entered the apartment... We feel like we got fooled.. The price was good, it's close to the city centre and there are good bed's, bathroom's and kitchen's items. We asked for 2 single beds, however we got a double and a sofa bed. Very nice apartment with good facilities. The free coffee, milk, and bottled water was a nice touch. A nice, comfortable apartment. The case when you want to return. Stable and fast internet. Very clean, everything match the photos.